The Prince Of Wales Opera House is the oldest still-operating Opera House in the Southern Hemisphere. It was built in 1871 by John Hart Cogden. 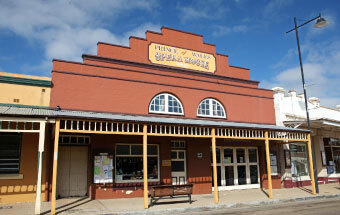 This classic building is now owned by the Gulgong Amateur Musical and Dramatical Society. Dame Nelly Melba has performed on its stage, several generations have seen their first theatrical production under this historic roof.